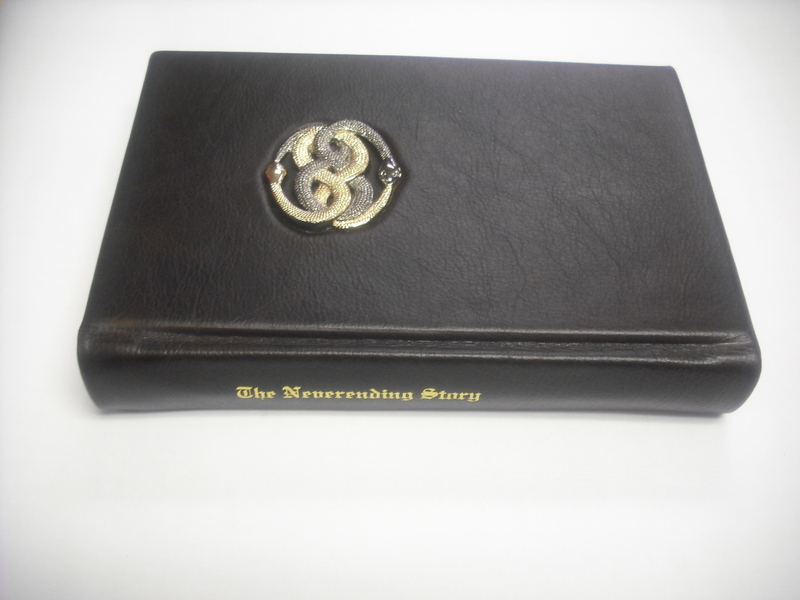 For that special gift or if you just like quality on your shelf you may opt to have our experienced group of bookbinders rebind an older book or newly bind your printed pages into a beautiful piece of art by using genuine leather. 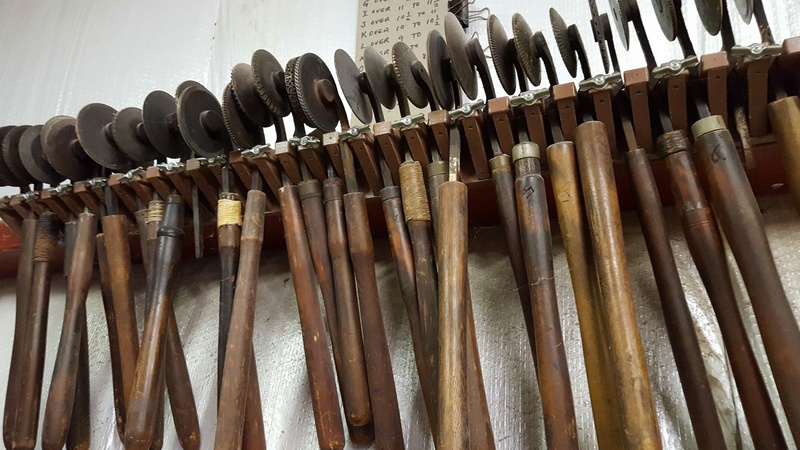 A picture really does tell it all, so instead of just text on this page we will use it to show some projects previous customers have done with us along with the techniques used. Everything is custom made to your specifications – size, foiling, end-papers, raised bands or not, very extravagant or simple. It’s up to you! 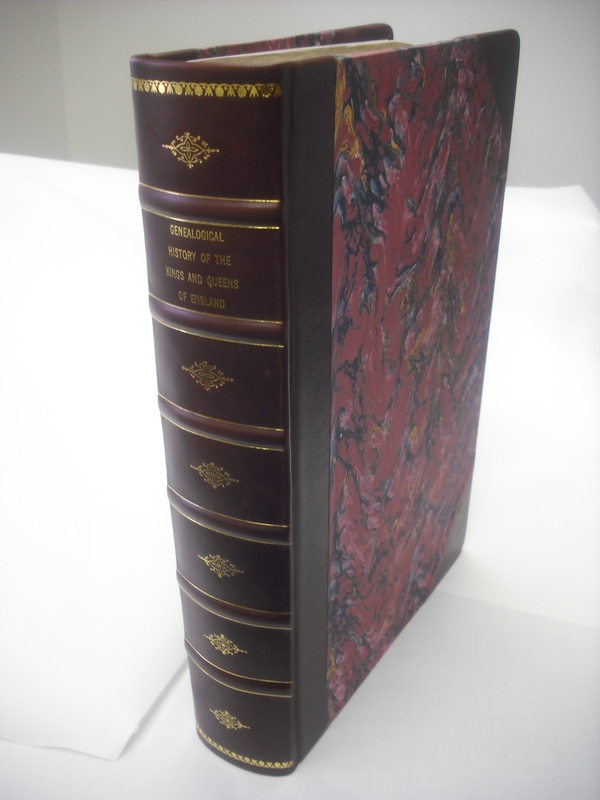 3/4 Leather & French Marble Binding: This customer had Grimm Bindery rebind The Genealogical History of the Kings & Queens of England. We used our Wine Glaze Leather on the spine and trimmed the corners in the same leather as well (we call this a “3/4” bind). The Glaze Leather is a very thick luxurious leather that comes from Argentina – described as buttery soft. The front & back covers on this piece used a French Marble paper. The spine was decorated with “Raised Bands” which are also known as “ribbing” or “hubs”. The title was gold foil stamped on the spine and some decorative rules were added to the edges of the raised bands. We also added top & bottom “rules” using a flowery design (“rolled” on with ancient brass fillet wheels – see photo below). There were also a number of floral starburst motifs added between the raised bands. Bernard Darwin 1/2 Bind: A “half-bind” is the binder’s version of a “half-calf” for the barista (pun intended, we’re binders, obviously not comedians). 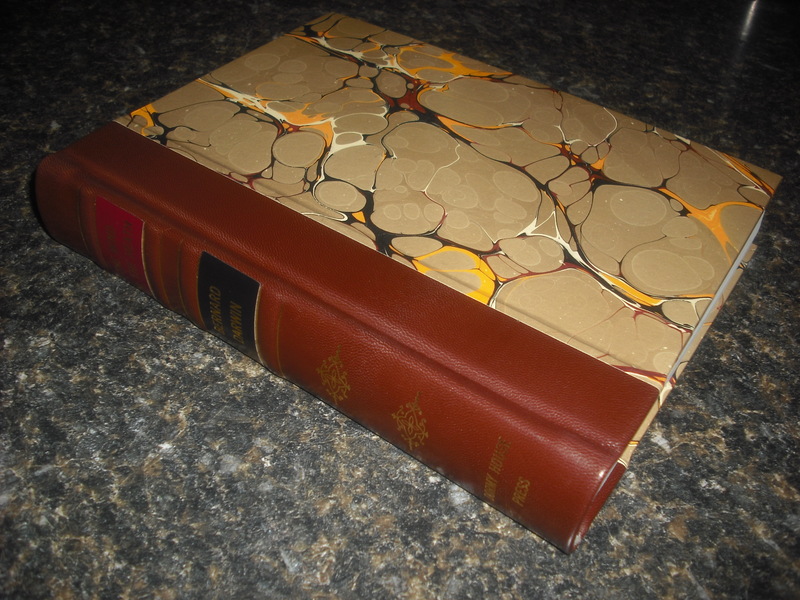 The spine is done in Kidskin leather, the front in specialty marbled paper with a beeswax finish for durability. This item also has a red label to give it some extra contrast and raised bands (aka ribs or hubbing). A little side note here – “Raised Bands” are a specialty addition to bindings to make them look classy. They originally came about because when you sewed the book “on cords” it left ugly bumps on the spine. Some clever binders thought, “Hey, let’s decorate this area so it looks intentional”. Years later, our sewing methods have advanced so we don’t have the bumps, yet we’re still adding these to the binding because individuals see it as a fancier binding. I often wonder what that original binder, who thought to create this technique would think about the fact that we’re still doing it even though the cords are long gone. Though, on very large bindings, or for specialty orders we still do sew on cords for strength. 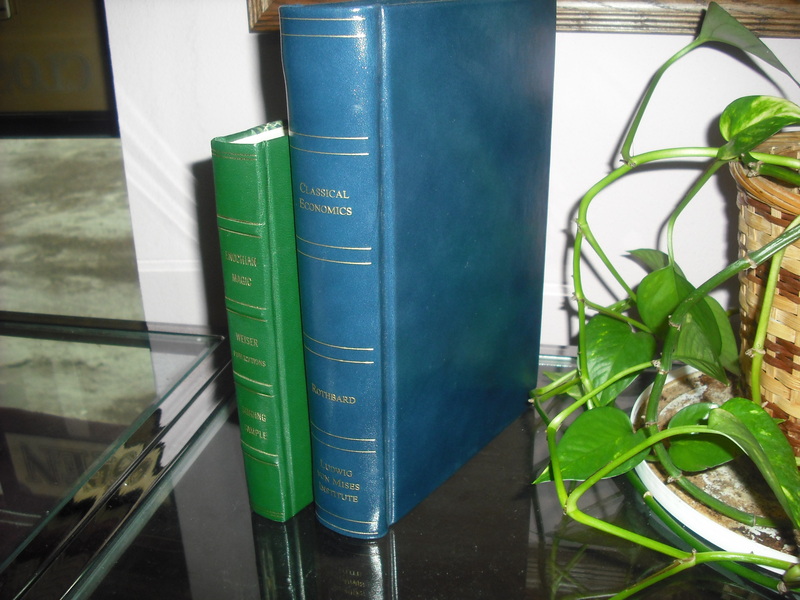 Also to note: The 1/2 bind and 3/4 bind above came about to save on leather – putting the leather on the part of the book that would wear the most with the less costly material on the rest of the cover. 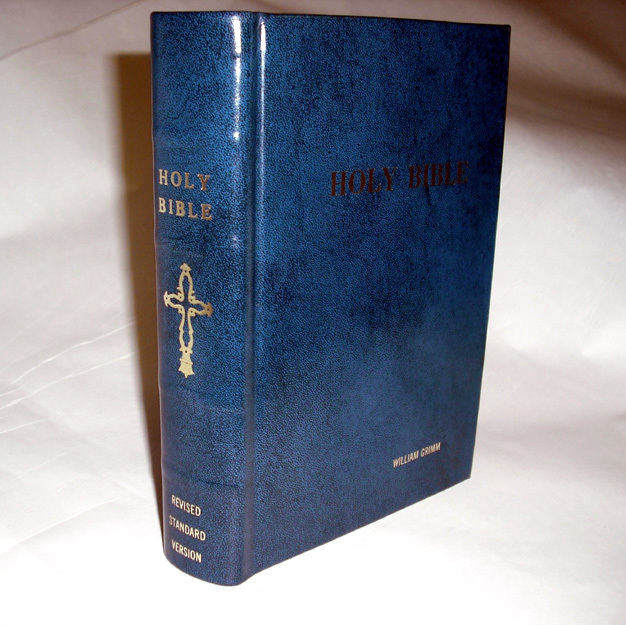 Blue Antique Cowhide Bible: Full leather hardcover bind with the title printed on the spine and front cover. Also, personalized in the lower right front corner with the name of the owner. This is often done on Bibles. The spine has a decorative cross added. We have a number of crosses and other decorations that can be added to the covers of books to spice them up a bit. 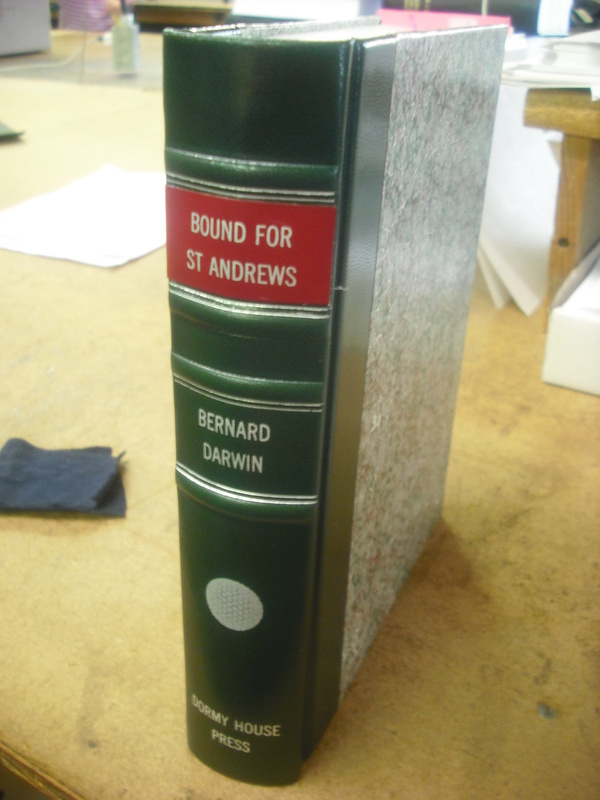 Customers often choose to have us make a custom plate with their design (such as the silver golf ball on the Bernard Darwin book at the top of this page). 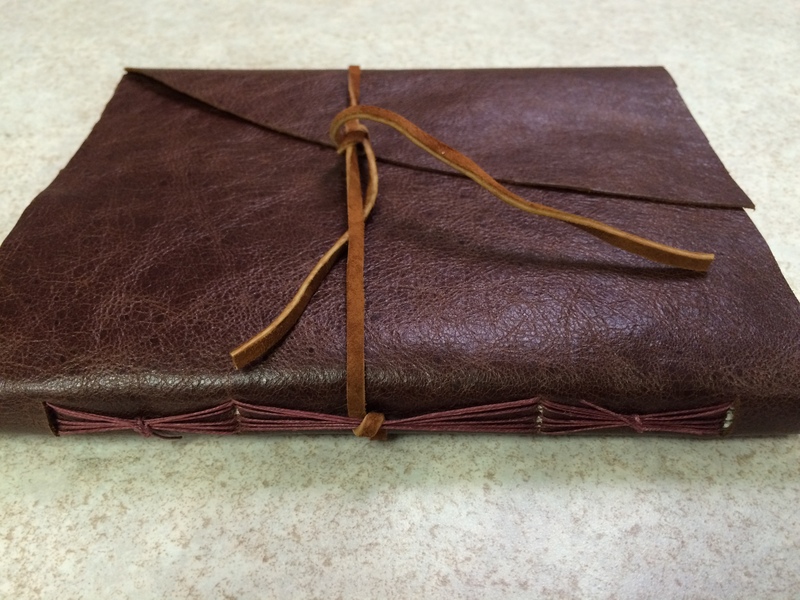 Wrapped Leather Journal: This was a specialty writing journal done in Tobacco Glaze leather (very thick & luxurious). Hand sewn with a colored binders threat on the spine and a leather cord wrap added to keep shut. For a touch of character you can get a charm from a craft store to add to the cord as well. Straight unfinished soft cover leather (no boards). Signatures inside were hand folded as well to give a rough look to the piece. Bernard Darwin Pecan Half-Bind: A companion book to the one further up the page. Two labels on this one, a red & black along with a few decorative embossings. Again with raised bands and beeswax protected marbled papers from England. Bernard Darwin was actually the grandson of the British naturalist Charles Darwin. A famous writer about everything golf. This book is full of his various writings on the subject. Red Glaze: Larger items are not a problem for us, we bind full size newspapers and atlases as well. This item wasn’t too big, around 14″ in height. Red Glaze leather with silver hot foil stamping. Leather Spines: Just a couple of basic full leather bindings. The green leather has raised bands and the blue has “false” bands or “paneling”. There are no “bumps” on it, but just the gold tooling to give the look & feel of raised bands without the extra cost. 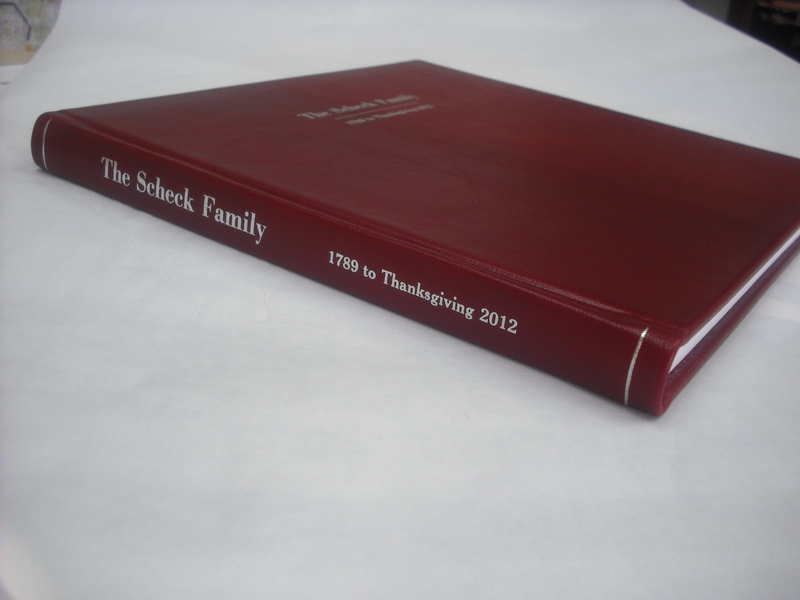 Black Glaze Inset: The customer for this order wanted a special inset to be added to the cover of the book. They provided the metal piece and we did a double board, removing space in the top board for the metal piece to be added.